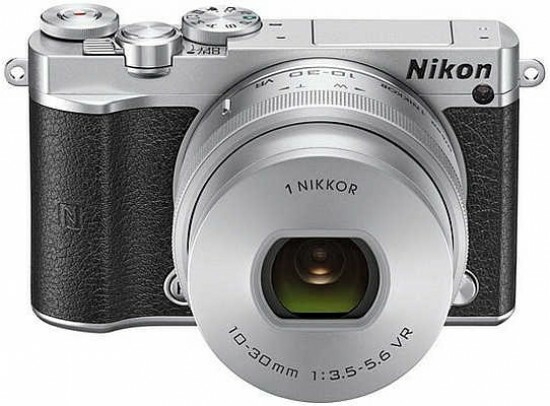 The Nikon 1 J5 is a new compact system camera featuring a 20-megapixel 1"-type CX sensor format sensor with no low-pass filter and the Nikon 1 lens mount. Boasting continuous shooting speeds of 20fps with continuous autofocus and 60fps with fixed-point autofocus, 4K and Full HD 60p video capture, time-lapse movie shooting, an advanced hybrid auto-focus system with 171-points, Best Moment Capture and the unique Motion Snapshot Mode, the Nikon J5 also offers more conventional shooting modes like Programmed Auto, Aperture and Shutter Priority, as well as Metered Manual. Also on-board is a tiltable 3-inch touchscreen LCD display, an electronic shutter, a sensitivity range of ISO 100-12,800, next-generation EXPEED 5A image processor, built-in Wi-Fi and NFC connectivity, a new control wheel, an aluminium housing and a built-in pop-up flash. The Nikon 1 J5 is available in three colour combinations: all-black, silver-white and silver-black. The Nikon 1 J5 costs £349.99 body-only, $499.95 / £429.99 / €539.00 with the 1 Nikkor 10-30mm f/3.5-5.6 PD-Zoom lens, $749.95 / £559.99 / €709.00 with both the 1 Nikkor 10-30mm f/3.5-5.6 PD-Zoom and 1 Nikkor VR 30-110mm f/3.8-5.6 lenses, and $1,049.95 with the 1 Nikkor 10-100mm f/4-5.6 lens. The Nikon 1 J5 is mostly made out of aluminium with magnesium alloy reinforced parts and is therefore heavier than you would think based on its size alone (98.3 x 59.7 x 31.5 mm), weighing in at 231g for the body only (40g heavier than its predecessor, the J4). It now has a small hand-grip which can accommodate two fingers, a big improvement on the grip-less J4, plus there's an new thumb-grip on the rear too. 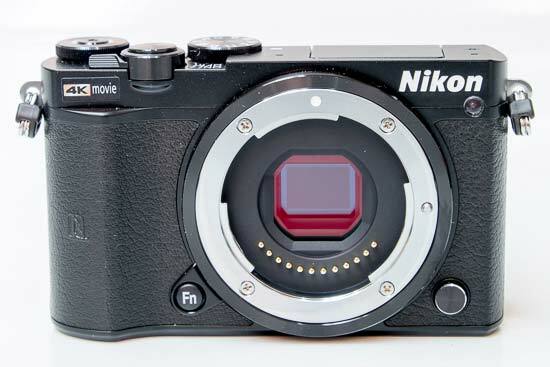 The new J5 has a clean, minimalist front plate that's dominated by the Nikon 1 lens mount. Instead of being a scaled-down version of the good old F mount, it's a completely new design that provides 100% electronic communication between the attached lens and the camera body, courtesy of a dozen contacts. Just like on the manufacturer's F-mount SLR cameras, there is a white dot for easy lens alignment, although it has moved from the 2 o'clock position (when viewed front on) to the top of the mount. The lenses themselves feature a short silver ridge on the lens barrel, which needs to be in alignment with said dot in order for you to be able to attach the lens to the camera. While this may require a bit of getting used to, it actually makes changing lenses quicker and easier. With no lens attached, you can see the sensor sitting right behind the plane of the bayonet mount. The sensor is a brand new 20.8 megapixel imager. Measuring 13.2x8.8mm this "CX" format imaging chip has double the surface area of the sensors typically used in compact and bridge cameras, but only about half the area of a Micro Four Thirds sensor. In linear terms, a Four Thirds chip has a 1.36x longer diagonal than the Nikon CX imager. Given that Four Thirds has a 2x focal length multiplier, the CX "crop factor" works out to about 2.72, meaning that a 10mm lens has approximately the same angle of view as a 27.2mm lens on an FX or 35mm film camera. The Nikon 1 Nikkor 10-30mm VR standard zoom is thus equivalent to a 27.2-81.6mm (or, practically speaking, 28-80mm) FX lens in terms of its angle-of-view range. The rest of the Nikon J5's faceplate is almost empty, featuring only the new Fn button, the lens release button and a small AF assist/self-timer lamp. There are two ways of powering on the Nikon 1 J5. You can either use the new on/off switch which encircles the shutter release or, if you have a collapsible-barrel zoom lens attached, you can simply press the unlocking button on the lens barrel and turn the zoom ring to unlock the lens, an act that causes the camera to switch on automatically. This is an ingenious solution as you need to unlock the lens for shooting anyway. Start-up takes just over a second - nothing to write home about but still decent and entirely adequate. You can only frame your shots using either the rear screen - there's no optional electronic viewfinder as on the V3 model, a key difference between the two. The LCD is a three-inch, 1037K-dot display that boasts wide viewing angles, great definition and accurate colours but only so-so visibility in strong daylight. Usefully the screen can now be tilted upwards through 180 degrees and downwards by 86 degrees, making it easier to take the ubiquitous selfie as well as overhead shots, and you can also use the new Self-portrait mode to soften skin or set the Self-timer. Nikon have also included touch functionality to the V3's screen, offering the ability to tap almost anywhere to either focus or to both focus and take the picture at the same time. You can also interact with some of the onscreen settings and use the main menu system too. The virtual horizon displays roll (horizontal inclination) and pitch (forward or rear inclination) information, useful for keeping everything straight. We did miss having an EVF when using the J5, as holding the camera up to eye-level helps to stabilise the lens and avoid camera shake. The Nikon 1 J5 has a small, top-mounted mode dial that now has most of the shooting modes that are usually found on similar dials - most notably P, A, S and M - something that was bizarrely missing from the J4. In addition to PASM the J5's mode dial has six other settings, Motion Snapshot, Best Moment Capture, green Auto Photo for beginners, the Creative mode, Video and the new Sports mode. 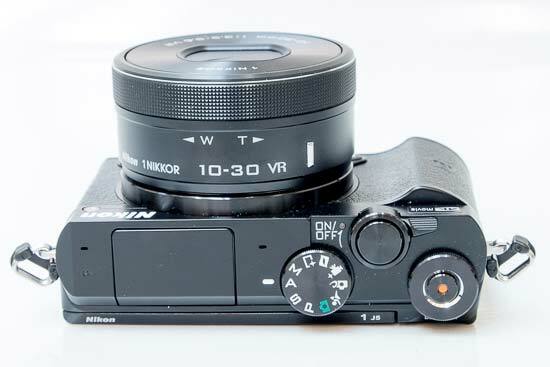 One major change to the Nikon 1 J5 is the addition of a control dial, which encircles the one-touch movie button on top of camera. The inclusion of PASM modes, the Fn button on the front, the handgrip and this new control dial all signify the J5 being a more serious camera for enthusiasts, rather than a purely-consumer focused camera like the previous J4 was. The four-way controller on the rear has four functions mapped onto its Up, Right, Down and Left buttons; including the "F" function, exposure compensation, flash mode and self-timer, respectively. Although this isn't a bad choice of functions, the fact that there is still no ISO button will doubtless cause a lot of photographers interested in buying the Nikon J5 to be unhappy. The F button opens a mini GUI with aperture, shutter speed, ISO, focus mode, metering, picture control white balance all available at the touch of a button. The J5 has a a scroll wheel around the four-way pad which in conjunction with new command dial is used to set the shutter speed in Manual and Shutter Priority modes. Last but not least, there are four small buttons around the navigation pad, flush against the rear panel of the camera, including Playback, Menu, Wi-fi (which offers one-touch access to the camera’s Wi-Fi functions) and Delete. The Auto Photo mode, marked with a green camera icon, is for beginners, with a much reduced set of options on offer (image quality, image size and continuous). The Nikon J5's Scene Auto Selector is a smart auto mode in which the camera analyses the scene in front of its lens and picks what it thinks is the right mode for that particular scene. You can also choose one of the conventional PASM modes, which give you full menu access and the ability to manually set the aperture, shutter speed, or both (Program AE Shift is available in P mode). ISO and white balance can also be manually selected, but only from the menu, as already mentioned. Of course there's AWB and auto ISO as well, with the latter coming in three flavours (Auto 160-800, 160-3200 or 160-6400) allowing you to specify how high you want the camera to go when the light gets low. You can also choose from three AF Area modes, including Auto Area, in which the camera takes control of what it focuses on (this isn't a great mode to have as your default as the camera obviously can't read your mind and may focus on something else than your actual subject); Single Point, in which you can pick one of 171 AF points by first hitting OK and then moving the active AF point around the frame using the four-way pad; and Subject Tracking, in which you pick your subject, press OK and allow the camera to track that subject as it moves around, as long as it doesn't leave the frame of course. The J5 is the latest Nikon 1 camera to offer built-in connectivity. The wi-fi function essentially pairs the J5 with an iOS or Android smartphone or other smart device, and allows you to edit and share images directly to social networking sites like Facebook, Instagram, or Twitter. It also makes it possible to control the J5 remotely via a smart device using the free Wireless Mobile Utility app, and set the focus point using the smart device's touchscreen. NFC connectivity is also now included. The Nikon 1 J5 has an intriguing hybrid auto-focus system that combines 105 focus points with phase-detection AF and 171 focus points with contrast-detect AF. This allows the Nikon 1 J5 to focus extremely quickly in good light, even on a moving subject. The company claims the Nikon 1 system cameras are the fastest-focusing machines in the world, and this matches our experience - as long as there's enough light. When light levels drop, the camera switches to contrast-detect AF which, though faster than on most cameras, isn't nearly as fast as the other method. It's always the camera that decides which AF method to use - the user has no influence on this. Generally speaking, the J5 will usually only resort to contrast detection when light levels are low. In good light, we were able to take sharp photos of fast-moving subjects. The Nikon J5 certainly does not disappoint here. Manual focusing is also possible, although the Nikon 1 lenses do not have focus rings. If you want to focus manually, you first have to hit the AF button, choose MF, press OK and then use the scroll wheel to adjust focus. To assist you with this, the Nikon J5 magnifies the central part of the image and displays a rudimentary focus scale along the right side of the frame - but those are the only focusing aids you get. There's still no peaking function available as on some rival models. 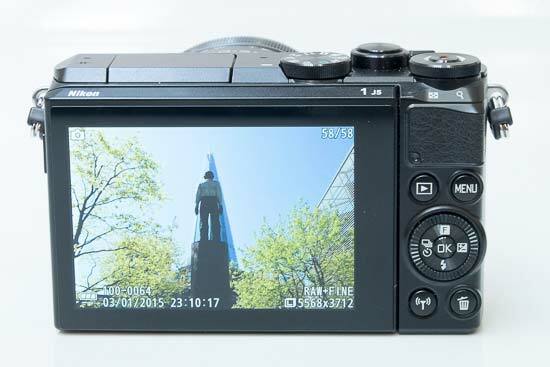 The J5 has an electronic shutter (the V3 also has a mechanical shutter). It's completely silent (the focus confirmation beep can be disabled from the menu) and allows the use of shutter speeds as fast as 1/16,000th of a second and, with the Electronic Hi setting selected, lets you shoot full-resolution stills at 60 frames per second. Note however that while this is a major achievement, it's limited by a buffer that can only hold 40 raw files. Additionally, the use of this mode precludes AF tracking - you have to lower the frame rate to a still very fast 20fps if you want that - and the viewfinder goes blank while the pictures are being taken. About the only application we can think of where shooting full-resolution stills at 60fps could really come in handy is AE bracketing for HDR imaging. At this rate, a series of 5 bracketed shots could be taken in less than 0.1 second, rendering small movements that can otherwise pose alignment problems - like leaves being blown in the wind - a non-issue. Alas, the Nikon J5 still doesn't offer such a feature - in fact it does not offer autoexposure bracketing at all, something that was also missing in the J4. Grabbing the headlines is the ability to record 4K movie footage, though sadly it's only at a very jerky frame rate of 15fps. The Nikon 1 J5 can also be set to shoot Full HD video footage, and you get to choose from 1080p at 60fps or 30fps. If you don't need Full HD, there's also 720p at 60fps, which is really smooth and still counts as high definition, and also at 120fps for slow-motion movies. The Nikon 1 J5 is also the first 1-series camera to feature time-lapse movie shooting. Set the camera to take shots every five, 10 or 30 seconds and you record Full HD time-lapse clips composed of up to 300 photos. Secondly, you get full manual control over exposure in video mode. This is an option; you don't have to shoot in M mode but you can if that's what you need. Thirdly, you get fast, continuous AF in video mode, and it works well, especially in good light. Movies are compressed using the H.264 codec and stored as MOV files. 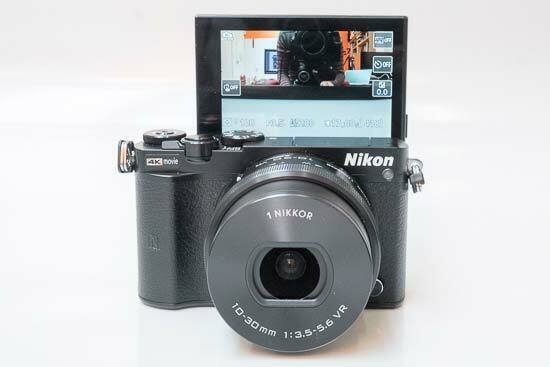 There are separate shutter release buttons for stills and video, and thanks to this - as well as the massive processing power of the Nikon J5 - you can take multiple full-resolution stills even while recording HD video. This works in the other way round too - you can capture a movie clip even when the mode dial is in the Still Image position, simply by pressing the red movie shutter release. We found that in this case the camera will invariably record the video at 720p/60fps. The Auto Image Capture mode analyses every video frame and automatically records a still image when conditions are best, while the Fast Motion, Jump Cut, and 4-Second Movie modes extend the J5's video versatility even further. The Nikon 1 J5 can also shoot video at 400fps for slow-motion playback. The resolution is lower and the aspect ratio is an ultra-widescreen 2.67:1, but the quality is adequate for YouTube, Vimeo and the like. These videos are played back at 30fps, which is more than 13x slower than the capture speed of 400fps, allowing you to get creative and show the world an array of interesting phenomena that happen too quickly to observe in real time. The Nikon J5 goes even further by offering a 1200fps video mode, but the resolution and overall quality is too poor for that to be genuinely useful. There are three Best Moment Capture modes. Smart Photo Selector allows the camera to capture no less than 20 photos at a single press of the shutter release, including some that were taken before fully depressing the button. The J5 analyses the individual pictures in the series and discards 15 of them, keeping only the five that it thinks are best in terms of sharpness and composition. This feature can be genuinely useful when photographing fast action and fleeting moments. The Active Selection mode takes up to 40 full-resolution shots in less than a second and lets you choose the one to keep. The Slow View mode captures up to 40 full-resolution continuous shots and displays them in slow motion on the LCD screen, making it easier for you to select the exact moment that you want to keep from the burst sequence. The new Sports mode on the shooting mode dial offers instant access to the camera’s burst modes and lets you view fast-action sequences as one group of shots. The Creative Palette is available in the camera’s Creative Mode and effectively allows you to adjust the brightness, saturation simply by sliding your finger around the ring on the touchscreen or by rotating the multi selector dial, with a live preview before the picture is taken. In the innovative Motion Snapshot mode the Nikon 1 J5 records a brief high-definition movie - whose buffering starts at a half-press of the shutter release, so again includes events that had happened before the button was fully depressed - and also takes a still photograph. The movie and the still image are saved in a single MOV file. The Nikon J5 stores photos and videos on microSD/SDHC/SDXC memory cards. The camera runs on a smaller EN-EL24 battery to its V3 big brother, and is consequently capable of producing considerably less shots on a single charge, managing around 230, although it does help to make the camera body more compact. The camera's tripod socket is made of metal and is positioned in line with the lens' optical axis. This also means that changing batteries or cards is not possible while the J5 is mounted on a tripod, as the hinges of the battery/card compartment door are too close to the tripod mount.